IND$FILE is a file transfer facility used to transfer data between MVS host systems and PC workstations. It can translate text files from EBCDIC to ASCII (mainframe to PC) or ASCII to EBCDIC (PC to mainframe) during the transfer. The file transfer dialog is part of the 3270 terminal emulator which calls IND$FILE on the mainframe, therefore the exact process of choosing files to send or receive is dependent on the terminal emulator implmentation. Check the documentation of your terminal emulator for specific details. I will demonstrate using Tom Brennan's Vista tn3270, a popular Windows 3270 terminal. The steps involved in installing IND$FILE are almost identical to installing RPF. IND$FILE can be downloaded from the Hercules H390-MVS Yahoo! Groups file section. There are several files in the ZIP file, but the ones we're interested in are ind$file.jcl and ind$file.het. Vary the tape drive online by entering v 480,online on the master operator console (the first 3270 console you connected to Hercules). Attach the tape by entering devinit 480 /path/to/ind$file.het where /path/to is the path to ind$file.het. Now that IND$FILE has been installed, it's time to use it. Make sure you are at a TSO READY prompt or in the RPF TSO Command Processor (option 6) before you transfer a file with IND$FILE. 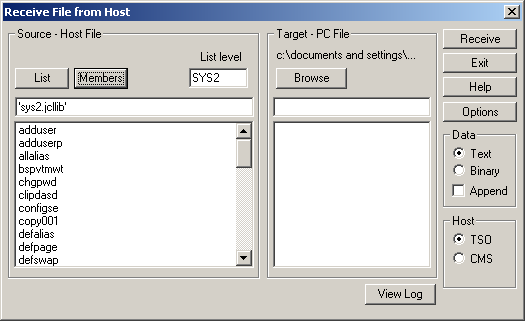 In this example, I'll copy a job from SYS2.JCLLIB to my PC. Click the Transfer menu and select Receive From Host. Vista tn3270 has a convenient feature that will allow you to browse MVS datasets in the transfer dialog. In this case, type SYS2 (the high level qualifier) in List level and click List. The listbox below will be populated with dataset that reside on MVS. Since we want a file from SYS2.JCLLIB, click 'sys2.jcllib' and click Members to display a list of all the members in the SYS2.JCLLIB dataset. 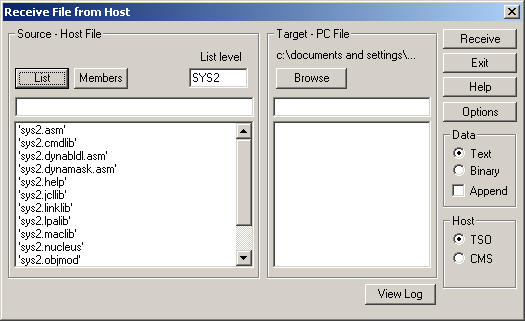 For this example, we will transfer the CHGPWD member of SYS2.JCLLIB, a job used to change userid passwords. Select chgpwd in the listbox and click Browse on the Target side to pick a location to transfer the file to on your computer. Make sure the Data type is Text since the CHGPWD is a job with text and make sure the Host is TSO. CMS is used when transferring files from VM (something you will never do while in MVS). If you perform the transfer from within the RPF TSO Command Processor, you will see a message that says RPF-TSO: ready and three asterisks underneath. Press PF3 twice to get back to the RPF main menu. If you perform the transfer from TSO, you will just be returned to a READY prompt after the transfer. Partitioned datasets must exist prior to file transfer. You cannot send a file to HERC01.MYSRC(MEMBER01) if HERC01.MYSRC does not already exist.